The T100 is beyond reasonably priced, but can it get the job done? 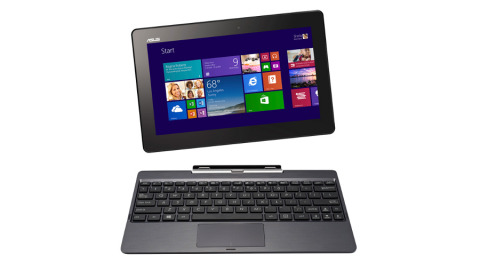 The T100 is a versatile laptop and tablet hybrid that arrives with full Windows 8.1 and an eye-catching price tag. That said, be aware of its cramped keyboard and average internal horsepower. Netbooks earned something of a bad reputation before going the way of the dodo a few years back, but they undoubtedly struck a chord for their affordability and portable leanings. Taiwan-based company Asus was one of the first to out a netbook with its Linux (and later Windows) powered Eee PC in 2007, so it's fitting that its Transformer Book T100 embodies the spirit of one. A convertible 10.1-inch tablet, the T100 is portable, runs the full-fat version of Windows 8.1 that lets you install your old desktop programs alongside apps from Microsoft's Windows store and transforms into a laptop when you clip on its accompanying keyboard. As with other Transformer devices, the T100 provides two form factors in one, negating the need for a second device. The question is: can it live up to the task of being a competent laptop while serving up a decent tablet experience? The answer to that is yes and, well, sort of. The Transformer Book T100 houses Intel's low-power, moderate-performance Atom platform, Bay Trial, which has featured in a number of 8-inch Windows 8.1 tablets including HP's Omni 10, the Toshiba Encore and the Dell Venue 8 Pro. It's up against some stiff competition in the 10-inch arena too, including Lenovo's ThinkPad 2, Acer's Iconia W510 and even Microsoft's Surface Pro 2. The chip outpaces its processor, Clover Trail, in the performance stakes, lending it more internal clout than last-gen convertibles such as Acer's Iconia W3 and HP's impressive but ageing Envy x2. Don't get too carried away though - you won't be privy to Intel Core-series performance here. That said, you won't be subjected to a heavyweight price tag either. At £349 (around US$571, or AU$640), the T100 falls into the same price category as 8-inch tablets, but the inclusion of the keyboard dock means that it's better value off the bat if you have tactile typing on the agenda.